Grooming is a normal aspect of rabbit behavior, but occasionally rabbits may develop unwanted grooming habits. Barbering is a form of grooming in which a rabbit repeatedly plucks the hair off itself or another rabbit. Barbering may be caused by several factors, ranging from dominance issues to nutritional deficiencies. Barbering can escalate to the point where rabbits that are housed together may need to be separated. When there is more than one rabbit, they may pull at each other’s fur because of dominance or boredom. Often the dominant animal will pull the fur off the submissive animal. Rabbits may chew their fur because they are not getting enough dietary fiber. Barbering may be caused by an infestation of parasites, such as fleas and mites and by skin diseases. Skin irritations are uncomfortable and can cause a rabbit to chew at its fur. Stress can increase the risk of barbering. If you notice that your rabbit has developed the habit of barbering, you may want to consider the causes mentioned above and determine whether one fits your rabbit. You will want to visit with a veterinarian to diagnose if the barbering is caused by an underlying medical condition such as parasites or a skin disorder and provide recommended medical treatments. Evaluate your rabbit’s diet to determine if it is getting enough fiber. Provide free access to quality grass hay so that the rabbit can chew on it to meet its fiber needs and prevent boredom. In addition, this will ensure that hair consumed during grooming will pass through the digestive system without causing a blockage or hairball. Introducing rabbits to toys or providing them with more exercise may help prevent the behavior. 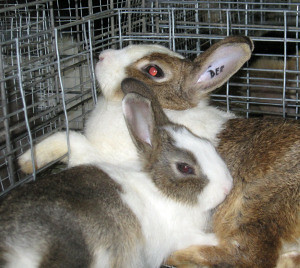 If changes to the environment do not stop your rabbits from barbering each other, separating the rabbits may be necessary. Ensure that the stress levels for your rabbit remain low. Provide a clean comfortable environment for your rabbit to live in. Because rabbits are a prey species, sudden noises, bright lights, and other environmental factors can cause stress that will result in barbering. Make sure your rabbit’s cage is in a quiet, low traffic location to decrease stress. For some rabbits, providing a radio or other white noise will help to decrease their stress level. If your rabbit continues to pull its hair even after environmental and dietary changes, consult your veterinarian immediately.